Home » Cat Supplies » Deodorizers and Stain Removers » Wee Wee Pads Super Strength Stain & Odor Remover » Wee Wee Pads by Four Paws SUPER SALE!! Home » Dog Supplies » Deodorizers and Stain Removers » Wee Wee Pads Super Strength Stain & Odor Remover » Wee Wee Pads by Four Paws SUPER SALE!! Home » All our PET SUPPLIES » Dog Supplies » Deodorizers and Stain Removers » Wee Wee Pads Super Strength Stain & Odor Remover » Wee Wee Pads by Four Paws SUPER SALE!! 300 Wee Wee Pads. 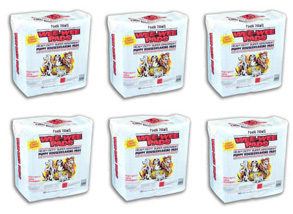 6 - 50 pack wee wee pads BEST PRICE ON THESE PADS - ALMOST A YEAR'S SUPPLY!!!! Four Paws Wee Wee Pads - 29.95 per 100 pads!!! - Take advantage of our GIGANTIC BLOWOUT PRICING !!!!! If you really go through Wee Wee Pads, buy a quantity of 2 (600 pads) and save even more! Each Pad Measures 23" x 24".